Graduates will be prepared with a solid foundation in mathematics, sciences, and technical skills needed to analyze and design civil infrastructure systems. Graduates will possess strong written and oral communication skills. Graduates will be familiar with current and emerging civil engineering and global issues, and have an understanding of ethical and societal responsibilities. Graduates will have the ability to obtain professional licensure, and will recognize the need for engaging in life-long learning. Graduates will have the necessary qualifications for employment in civil engineering and related professions, for entry into advanced studies, and for assuming eventual leadership roles in their profession. The main purpose of Basic Civil Engineering lab is to demonstrate the basic principles in the area of Chain surveying, Traversing to the undergraduate students through a series of experiments. The objective of the strength of materials lab. is to demonstrate the basic principles in the area of strength and mechanics of materials and structural analysis to the undergraduate students through a series of experiments. Tests such as the tension tests of a steel coupon, torsion of model circular sections and bending of a steel bar are conducted in the lab. Model truss and frames are also employed to illustrate the theory in structural analysis and the basic plastic theory of bending. The students are also introduced to the data acquisition system (Strain gauges and dial gauges etc) used in experimental study. The laboratory portion of this course will introduce you to some basic geologic principles, starting off with basic identification of geologic materials, map use and deformation of rock analogs. Then we will head outdoors to explore geologic and geophysical mapping techniques and illustrate environmental, geologic and engineering topics through visits to local field sites. 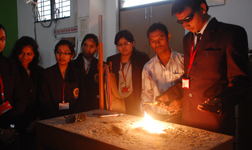 The material testing laboratory is used for the undergraduate courses Civil (CE) Engineering Materials. The lab is also used for graduate courses in metallics, advanced concrete materials, corrosion, and geomaterial characterization. The laboratory contains equipment to test tensile, compressive, and shear strength of various materials along with corrosion testing equipment for steel and reinforced concrete. The lab also contains a concrete cutting saw and concrete permeability testing equipment. This lab is Calibrated by AIMIL is a pioneer Instrumentation Company... An ISO:9001(2000) certified company. This Lab aims at developing an understanding of the behavior of fluids in motion or at rest and the subsequent effects of the fluids on the boundaries. The study of this subject will develop analytical abilities related to fluid flow. Instructional Objectives The students should be able to have: 1. Conceptual understanding of fluids and their properties. 2. Understanding of fluid statistics, fluid kinematics and fluid dynamics. 3. Basic knowledge of dimensional analysis and similitude. 4. Understanding of laminar and turbulent flows, and flow measurement. The objective of the Lab is to educate the students on the various components of Highway Engineering. 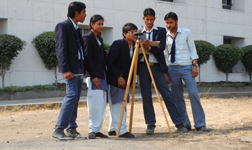 It exposes the students to highway planning, engineering surveys for highway alignment, Design of Geometric Elements of Highways and Urban roads, Rigid and Flexible pavements design. The students further learn the desirable properties of highway materials and various practices adopted for construction. This course enables the students to develop skill on evaluation of the pavements and to decide appropriate types of maintenance. The primary objective of this lab is to demonstrate environmental engineering testing procedures. This lab is continuously upgraded with the latest environmental equipment. It covers the four major pollution areas: air, soil and water contamination. Students contribute through water testing procedures to build a pollution database of the nearby rivers. A three meters high settling column is available for wastewater analysis. Other equipments include a micro-sentinel filtration system, a sound level meter, an air sampler and large size permeameters, in addition to instruments for in-situ water investigation. 1. To acquaint the student with some of the important laboratory tests for measuring the engineering properties of soils. 2. To encourage the student to study the literature to obtain information pertinent to the problem at hand. 3. To develop the student’s ability to analyze and interpret data, to reason logically, and to arrive at correct conclusions.